Detroit joined the NHL for the 1926-27 season, part of the first wave of expansion in the 1920s which saw the NHL expand into the United States for the first time. Detroit had bought most of the players of the Victoria Cougars of the Western Hockey League, and continued to use the Cougars name. The name was later changed to the Falcons, and then to the current Red Wings. 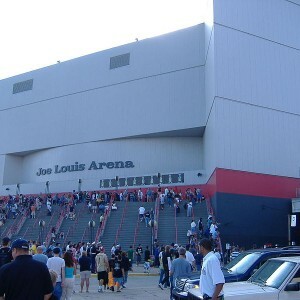 The franchise has played in three arenas: Border Cities Arena, Olympia Stadium, and Joe Louis Arena. Here is a list of the top ten scorers in each of the three arenas. Olympia Stadium was still under construction in 1926, so the Cougars did not play in Detroit during their first season. They played just across the Canadian border in Windsor, Ontario, at Border Cities Arena. The first game was played November 18, 1926. Duke Keats 9 8 with Detroit Cougars, 1 with Boston Bruins. Frank Foyston 7 All with Detroit Cougars. Archie Briden 5 4 with Detroit Cougars, 1 with Boston Bruins. Johnny Sheppard 5 All with Detroit Cougars. Clem Loughlin 4 All with Detroit Cougars. Jack Arbour 3 All with Detroit Cougars. Pete Bellefeuille 3 All with Detroit Cougars. Art Gagne 3 All with Montreal Canadiens. Bill Cook 3 All with New York Rangers. Jack Walker 3 All with Detroit Cougars. The final Detroit home game was played at Border Cities on March 26, 1927. The Cougars were not a high-scoring team, and Keats tops the list with only 9 goals. The highest scoring players for a visiting team were Art Gagne of the Canadiens and Bill Cook of the Rangers, with 3 each. Keats also scored one of his goals as a visitor, as he was traded from Boston to Detroit partway through the season. Nine other players scored 2 goals, and 37 players scored 1 goal, including three goals scored on March 2, 1929. This was a Chicago Blackhawks home game against the Montreal Maroons, played while Chicago Stadium was unavailable. Renamed Windsor Arena, the facility was the home rink of the Windsor Spitfires of the OHL until 2008. They played their first game on their current home ice on December 11th of that year. Olympia was completed in time for the first game of 1927-28 season on November 22, 1927. The Cougars became the Falcons in 1930, and the Red Wings in 1932. Gordie Howe 430 All with Detroit Red Wings. Alex Delvecchio 243 All with Detroit Red Wings. Norm Ullman 188 177 with Detroit Red Wings, 11 with Toronto Maple Leafs. Ted Lindsay 181 180 with Detroit Red Wings, 1 with Chicago Blackhawks. Nick Libett 126 All with Detroit Red Wings. Syd Howe 112 109 with Detroit Red Wings, 2 with St. Louis Eagles, 1 with Philadelphia Quakers. Mickey Redmond 109 106 with Detroit Red Wings, 3 with Montreal Canadiens. Sid Abel 102 All with Detroit Red Wings. Marcel Dionne 98 84 with Detroit Red Wings, 14 with Los Angeles Kings. Mud Bruneteau 92 All with Detroit Red Wings. Red Kelly 92 84 with Detroit Red Wings, 8 with Toronto Maple Leafs. The Red Wings played over 50 seasons at Olympia, until December 15, 1979. They won 7 Stanley Cups there, and most of the players on this list are members of the Hockey Hall of Fame. Like the other Original Six arenas, it was one of the most famous hockey shrines, although it was also one of the earliest to be replaced, after the original Madison Square Garden. It is no surprise that the highest scorer at Olympia is Gordie Howe, with 430. This is the highest number of goals by any player at any single arena. No one else has ever scored as many as 400. While Delvecchio’s 243 would be enough to top the list in many other arenas, Howe has almost twice as many. The highest scoring visiting player was a bit difficult to find. In the other Original Six arenas, the top scorer is easy to find: it’s always Howe. For Olympia, I had to search for the 7 or 8 most likely candidates. The top scorer was Bobby Hull, with 47. Joe Louis Arena has been the Red Wings’ home arena since December 27, 1979. Active players are in italics. Steve Yzerman 330 All with Detroit Red Wings. Sergei Fedorov 229 228 with Detroit Red Wings, 1 with Anaheim Ducks. Brendan Shanahan 177 172 with Detroit Red Wings, 3 with St. Louis Blues, 2 with New Jersey Devils. John Ogrodnick 158 156 with Detroit Red Wings, 2 with New Jersey Devils. Henrik Zetterberg 152 All with Detroit Red Wings. Niklas Lidstrom 148 All with Detroit Red Wings. Tomas Holmstrom 126 All with Detroit Red Wings. Gerard Gallant 124 All with Detroit Red Wings. Pavel Datsyuk 112 All with Detroit Red Wings. Vyacheslav Kozlov 108 105 with Detroit Red Wings, 3 with Atlanta Thrashers. Steve Yzerman is the highest scoring player at Joe Louis Arena. The Red Wings also played a number of home games away from Detroit, in the era of the “neutral site” games of the early 1990s. Fedorov and Gallant scored in Milwaukee, March 16, 1993, and Lidstrom and Kozlov scored in Cleveland, February 24, 1994. Joe Louis is equally as famous as its predecessor. The Red Wings have won another four Stanley Cups there. Somewhat unusually for an arena as old as Joe Louis, four of the top ten are currently active with Detroit. The next highest active player is Johan Franzen, with 81. The highest scoring visiting player is Brett Hull, with 26, but he also scored another 42 while playing for Detroit. The highest scorer who never played for Detroit is Doug Gilmour, with 19. My main sources were the game summaries at the Hockey Summary Project. For the 1926-27 to 1951-52 seasons, which are not covered by the HSP, I used the Google News archives of the Montreal Gazette, Ottawa Citizen, Calgary Daily Herald and Calgary Herald, Border Cities Star and Windsor Daily Star, Saskatoon Star-Phoenix and Saskatoon Phoenix, Pittsburgh Press, and Pittsburgh Post-Gazette. For Gordie Howe, the Sports Illustrated article “One Skate in Valhalla” (Pete Axthelm, February 12, 1968) broke down his first 400 goals into home and away goals. The Sports Illustrated article “The Captain By the Numbers” (Richard Deitsch, July 13, 2006) has 330 goals for Yzerman at Joe Louis, which matches my count. For a list of the top scorers at all the regular home arenas, see my list of goals per arena. See also my list of Gordie Howe’s goals at each arena.